Mayor James G. Woodward made the above reply to Chief James L. Beavers in a statement to The Constitution late Monday afternoon. They mayor declared that Febuary’s part in the conspiracy has destroyed his usefulness with the department, and he is not fit to serve with honorable men. 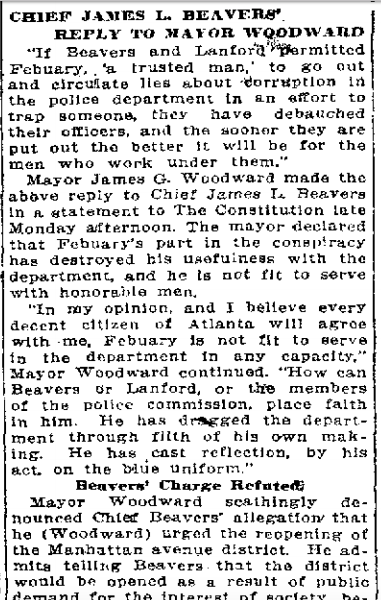 Mayor Woodward scathingly denounced Chief Beavers’ allegations that he (Woodward) urged the reopening of the Manhattan avenue district. He admits telling Beavers that the district would be opened as a result of public demand for the interest of society, because of the scattered conditions. 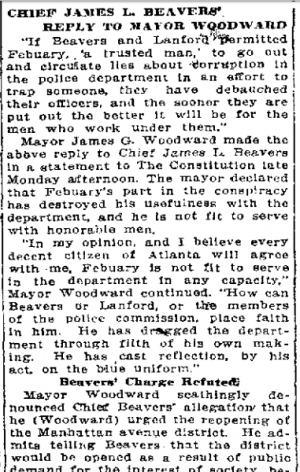 He declared that he has never placed a straw in the way of Chief Beavers’ vice crusade, and explained that whenever he called the chief to his office it was for the purpose of referring complaints to him—complaints of bad conditions in respectable neighborhoods. Mayor Woodward said that on one occasion he referred to the chief a letter written by a respectable woman—the mother of little children—who complained that there was an immoral house near her home, and she wanted the police to protect her and her babies. Mayor Woodward says that the only time he has called Beavers to task was when he received complaints of women being insulted in the central portions of the city. As to the Eva Clark affair, Mayor Woodward said that the women came to him and explained that herself and her mother wanted to move into a house near the Grady hospital—95 Armstrong street—and that he informed her that she had the right to live wherever she pleased, just so long as she conducted a moral house and lived within the law. He says that he laid the whole matter before Beavers just as the Clark women laid it before him. Mayor Woodward further stated that the whole affair casts a dirty reflection on the heads of the police department, and that the part they played in it branded them as being unfit to guard the lives and property of the people of Atlanta. “Men who will allow their personal characters and their offices to be dragged through such a mess cannot hope to gain the respect and esteem of the people they serve,” he said. “When Febuary came to me and told me that Beavers and Lanford were protecting disorderly houses and blind tigers, I knew that it was either true or that he was lying. Gave Him Benefit of Doubt. “I decided, for the time being, to give him the benefit of the doubt. If I had known that that visit to the Williams house would be the last time I would see him I would have shown him up for the liar that he is. But in the interest of the public I decided to give him leeway. I did not expose him, because I did not want to do the police department an injustice. “As for Colyar, I never heard of him until this thing came up. He may be a crook. As far as I know, it seems that Mr. Felder has known him for a long time, but it is no uncommon thing for one crook to turn up another to the police, or turn state’s evidence. “What he has done and as far as his evidence he claims to have about my moral turpitude as chief of police or as a citizen, I defy him to show anything wrong. If he is a good, loyal citizen, which he claims to be, why did he not go to the police commission and lay the evidence before them? Would Be in South Carolina. “Now, Mr. Felder knows well enough that if he had anything that would have been damaging, against the police department, he would have hurried to bring it to the proper authorities. “I would say that some one has been misled by Mr. Felder, or no doubt he would be in South Carolina today, where he belongs. “I see that Mr. Woodward says he has nothing against me personally. Now I don’t quite understand his connection with the Felder-Colyar affair. He knew that G. C. Febuary was a trusted employee of the police department and if Febuary knew of crookedness or graft in the department he would have forced him to divulge it or seen that he was turned out of the department. “If Febuary had known anything of the kind and not made it known he would have been equally guilty. “Mr. Woodward knows that in the frequent talks with me since he has been mayor there has hardly been a time that he did not bring up the question of the red light district, and he gave me to understand in his first talk with me that three women should be allowed to go back to Manhattan avenue where they had previously plied their nefarious trade. “Mr. Woodward also told me the first of the year that if my vice policy continued the police department would be reeking with graft like the New York department.